With Thanksgiving themed lessons, field trips, lots of reading and cuddles, and more autumn weather, this has been a very cozy week at the McGaugh Academy. We are closing in on the end of our third learning period with River Springs—the year is now zipping along, much like it used to in my own classroom at about this time. I am so utterly grateful for this time with my two kiddos, and I love watching their bond grow as they experience all of life together. As we enter this totally magical time of year, I cannot wait for all of our Christmas crafts and lessons! I love being their mommy, teacher, and cheerleader. We have so many pictures this week! 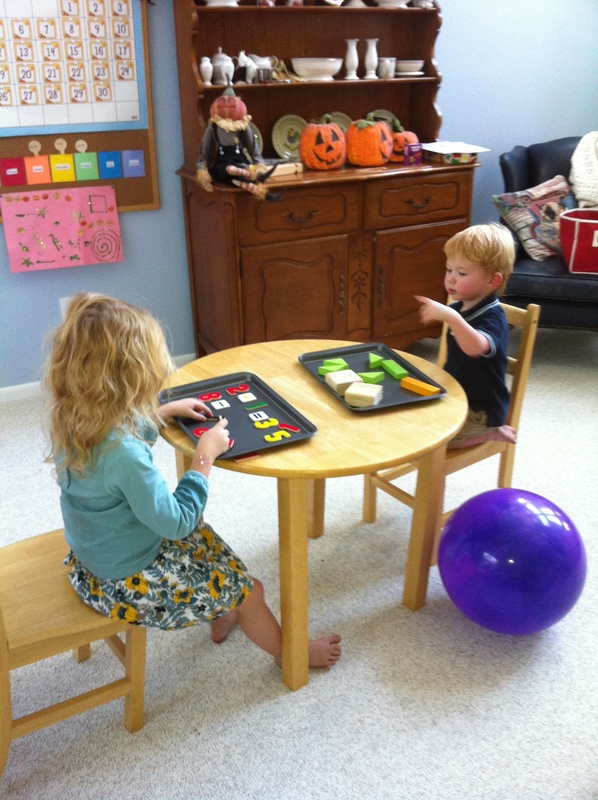 The kiddos had a couple of Montessori trays this week. I haven’t been using these as much, although I should because Eric is the prime age to benefit from them. 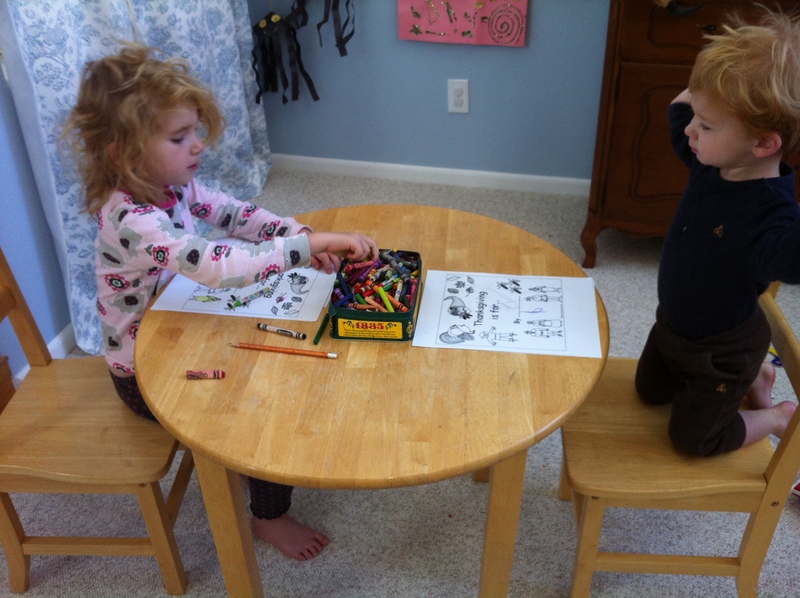 Katie worked with magnetic numbers to make and solve simple addition equations; Eric had a geometry tray. I was super excited for this tray, which I came up with one night and was kind of pleased that I did. 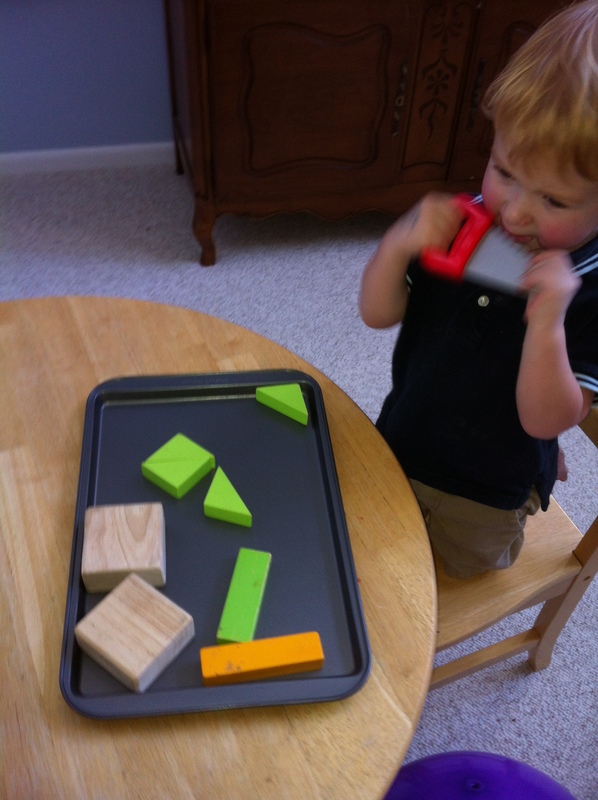 He had to use his pretend saw (which he adores) to “saw” a square made of blocks into its two component triangles, etc. It really put together for him some passions he has along with one of his favorite activities (block building) right now. A-maize-ing! We study maize this week and tied it into a larger Thanksgiving unit. So fun! 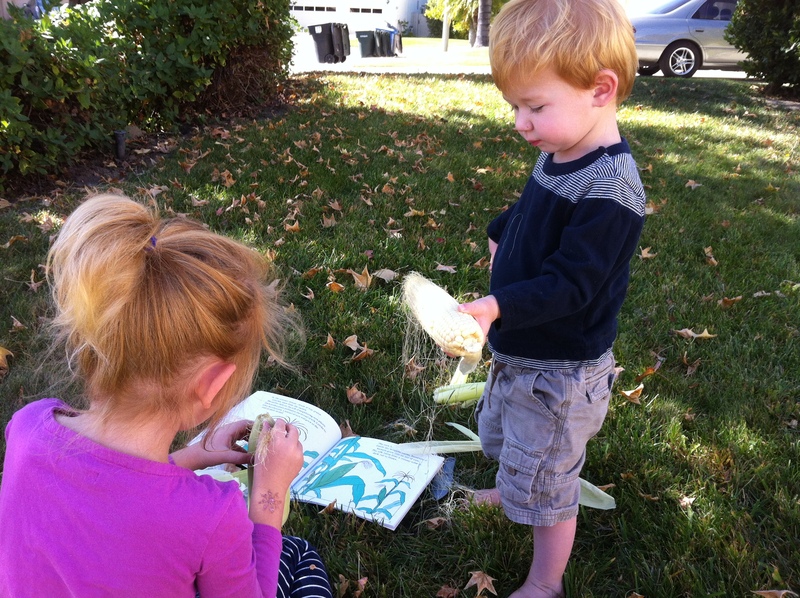 We used Aliki’s “Corn is Maize” book (which I picked up on a lark at Riley’s when we went to pick apples). So glad I did! We learned sooo much! Katie worked through some supplemental maize material from EnchantedLearning.com, and we added several hands-on activities to put history and science together. We studied maize nomenclature, how it pollinates, its uses and growth, etc. We watched BrainPop Jr. videos streamed through the Apple TV on the origin of Thanksgiving, Squanto, etc. It has been one of those units that feels like it has really come together, which doesn’t always happen, LOL! (Like our “Monster Unit” last year—big time tanker)! We shucked corn yesterday and practiced identifying the parts. This picture is dark, but I love the look on Eric’s face. He loves learning with his big sis. 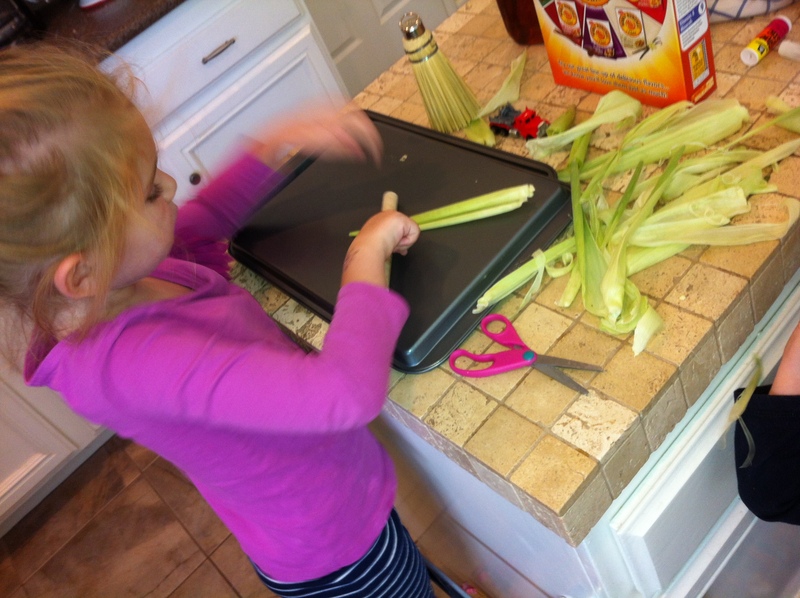 She got super into pretending she was a Native American working with corn. 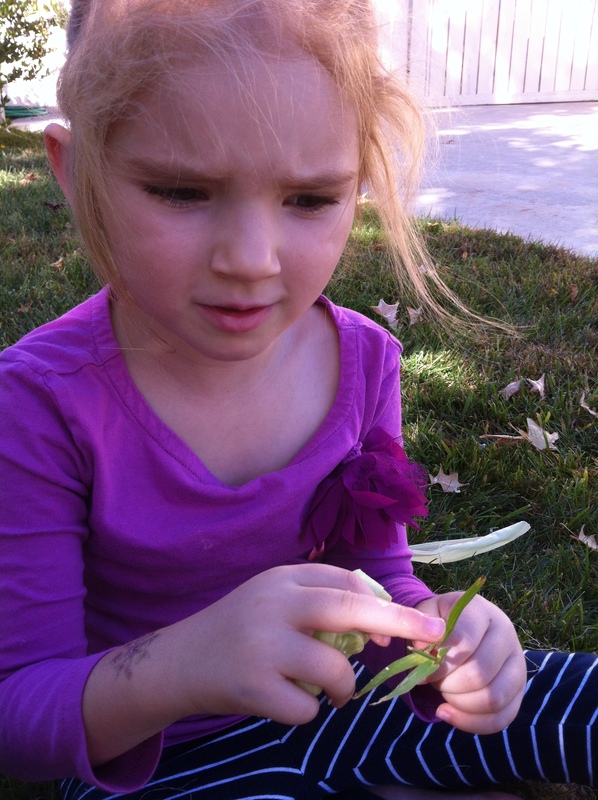 She fashioned a pretend “metate” on her own and wanted to pretend to make various corn dishes from the husks. I think next week (after I get to the market) we’ll make tamales. I’ve made these a couple of times before, and from what I know, they are traditional around this time of year. YUM! 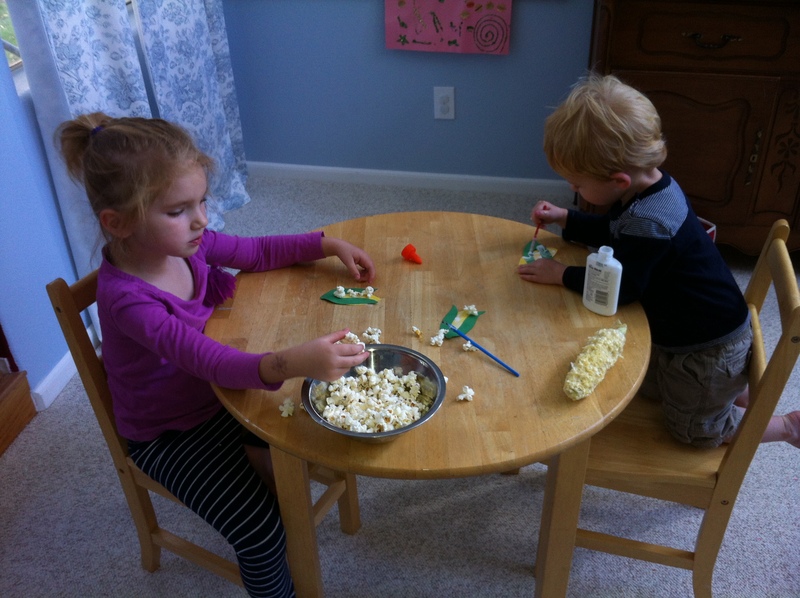 We had a little corn craft with construction paper and popped corn. Then we ate some of the popcorn of course! We also listened to an audio short story on Squanto (bought for our road trip, listened to through Colorado, and originally performed as part of NPR’s Rabbit Ears Treasury—we love all the Rabbit Ears audio books we own). Listening to an audio story all cuddled on the couch or while eating lunch is a nice alternative to TV and asks for different skills from our kiddos. Katie has a girl doll and Eric has a boy doll. It’s really true that simple toys can be the most captivating. I had all kinds of plans to make yarn hair and felt outfits for these dolls, but the kiddos were so jazzed to play with them just the way they were! They quickly left me and went off on their own to put the dolls in little “beds” they made on the floor with other toys. They both took them outside while I made lunch, and Eric rode around with his in his Cozy Coupe. The cornhusk dolls sat in their laps at lunch, cuddled with them during pre-nap story time, and Eric’s is now sleeping with him in his crib. You’d think they just had Christmas! Simple toys = big opportunity for imagination. I got a little carried away…and made this morning’s fruit salad into an attempted cornucopia design. I haven’t seen an example of this, so I was really just playing around. Katie wasn’t sure what it was (and she knows about cornucopias!) so I guess I’d better tweak the design! On Tuesday we took a field trip to our polling place to VOTE!!! 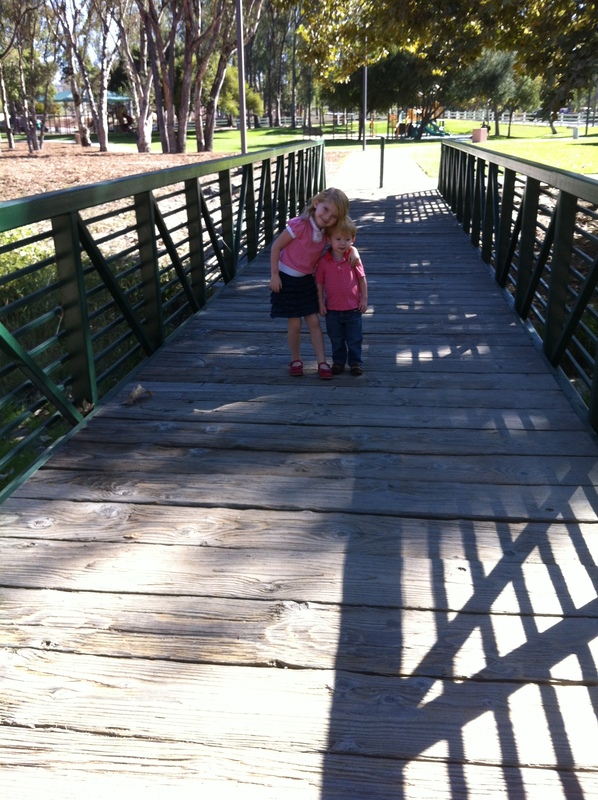 We all wore red and white stripes on top, with a blue field below (skirts and jeans). We like to make events out of things! Makes life fun! 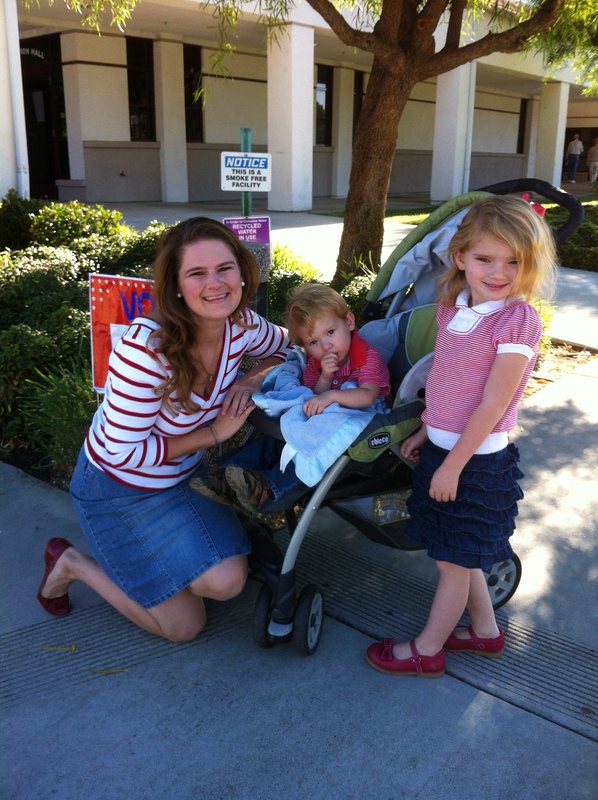 Kiddos were great while I marked my ballot, and the volunteers gave them “I voted” stickers, too. Katie felt proud to be part of this. We all watched the results together, too, until bed time. After the polls? Sports park time! I love how they love each other. He is my fearless climber boy! 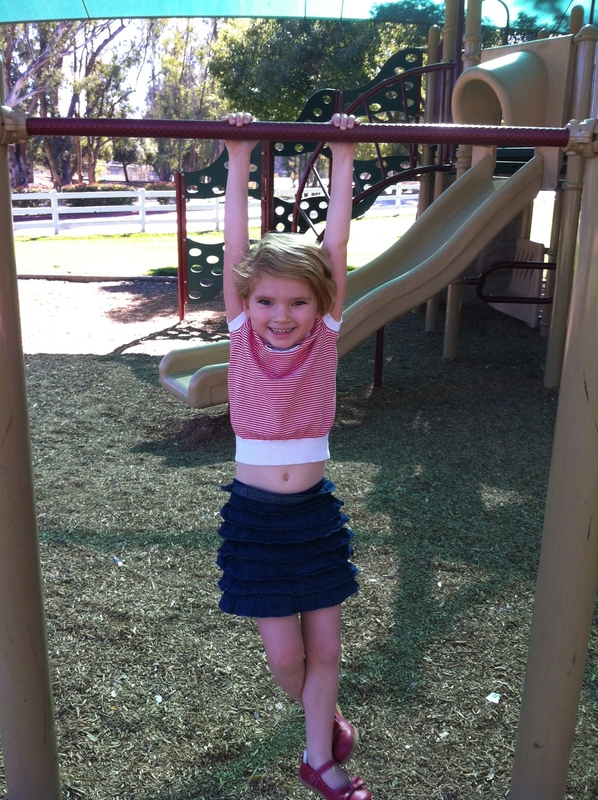 Katie loves to climb, too! 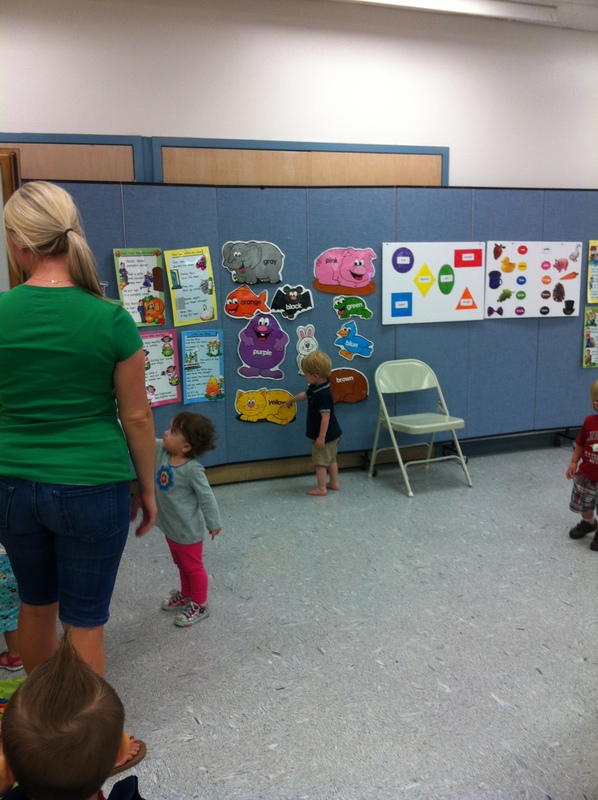 Eric, pointing out the yellow cat, had his last Toddler Time class (for the year) on Monday. We can attend classes again when they pick up in January, or we might branch out and do the Abrakadoodle class. Katie and I took Toddler Time only through the fall, and then we branched out into the art class and that was a good fit for her. Helping his teacher… When we left he gave her a big hug, and then in the car he said “Bye school!” knowing it was our last class for now. So sweet. I have savored this one-on-one time with my boy. 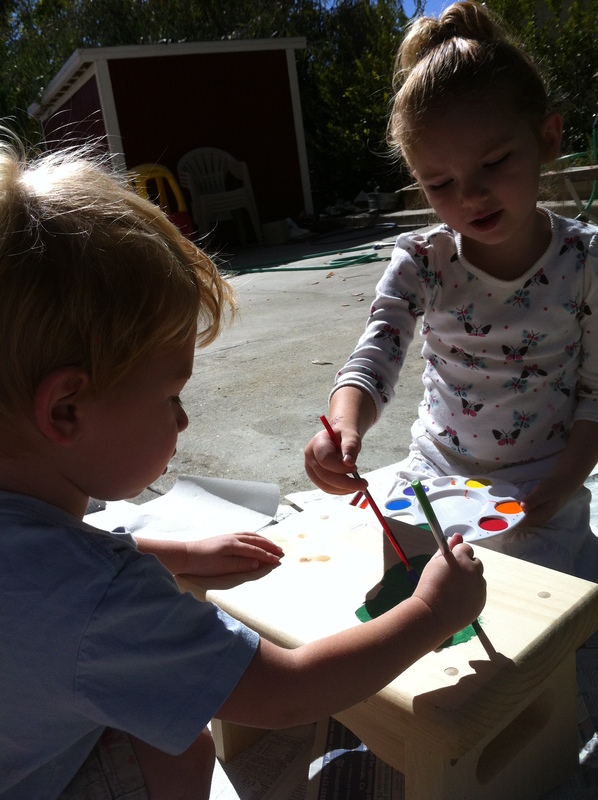 Eric got to paint his “big boy” step stool this week, and Katie helped. He was SO PROUD and pleased to have one of his own, finally, just like his sister. He’s been using it ever since. 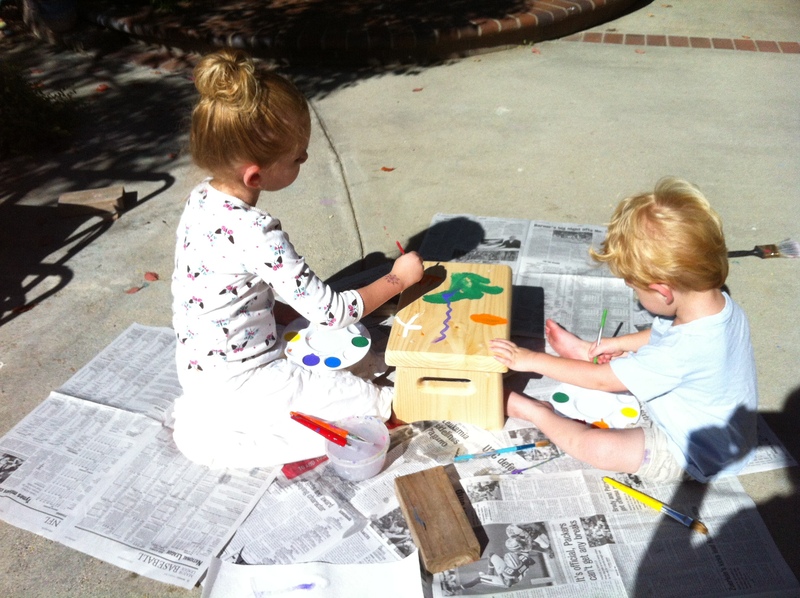 Step stool painting—a rite of passage in our house! During one of Eric’s naps, Katie had a big painting sesh. 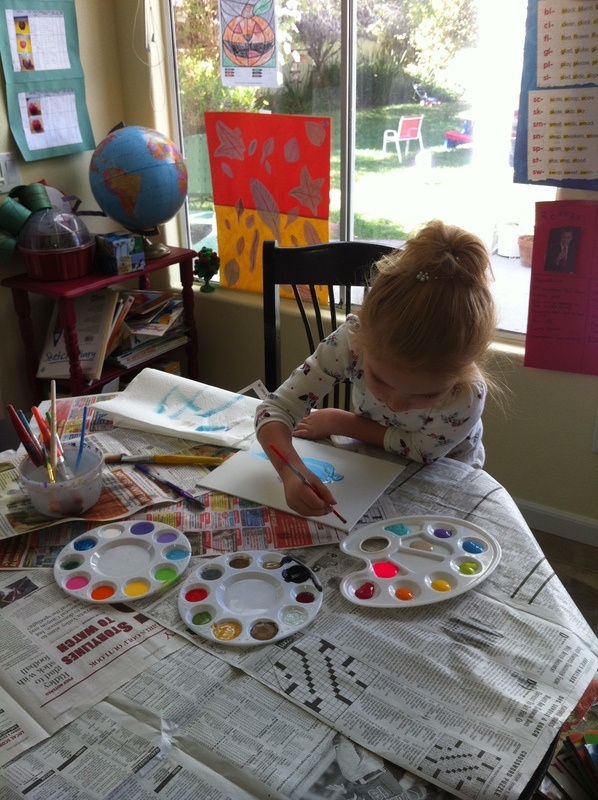 She got some new paints and canvases from Amie and Boppa for her birthday. She was in HEAVEN! Talking with Jacob (this boy is amazing! so many goals!!!) about the cool trophies. She really loves her trophy, and I am so proud of her. Family Date Night to the Valley Winds “Autumn Serenade” concert at the Old Town Community Theater. Waiting for the concert to begin! We got to see my brother’s family-in-law, so part of our extended fam. Some of them play in the Valley Winds, just as my brother and sis-in-law used to. We were lucky to see my brother’s mother-in-law and our cousins-in-law and Great-grandma Bea when they arrived, so we all got to sit together! The concert was AWESOME. Bill and I used to teach with Tom, the conductor, and it is always great to see him and hear how much he knows about all the pieces (which he would introduce before playing). Several arrangements were audience-friendly to the kiddos, who were familiar with many of the tunes like “Shenandoah,” and some of the Wizard of Oz Tunes. The Sousa marches were excellent, and the Valley Winds played their absolute bottoms off on “Stars and Stripes Forever.” So good. One of my favorite Valley Winds concerts! And it was Mr. Eric’s first experience with live theater, too! He did great! He loved sitting on my lap, and I would whisper everything that was going on, talking about the instruments, the conductor, everything. 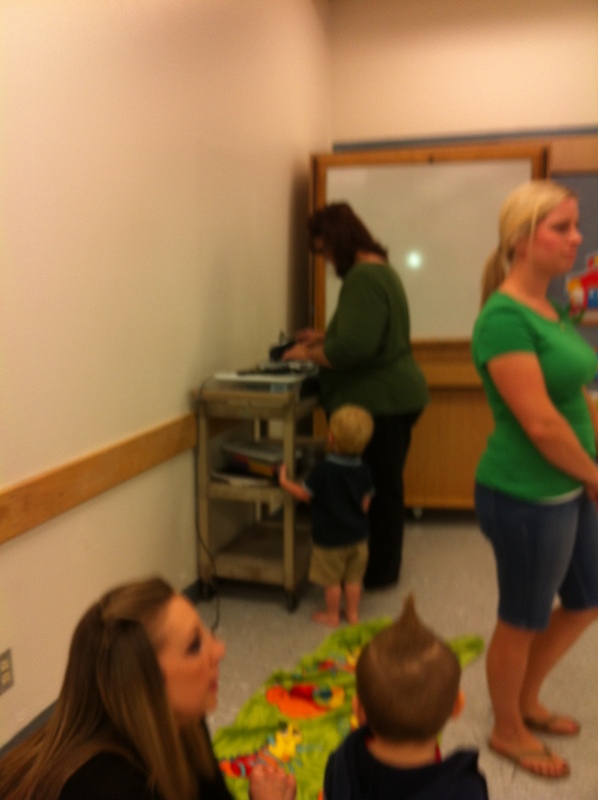 He loved watching Tom and was a good, mostly quiet and attentive little boy—especially during the pieces. It was only in between pieces that he would clap and call out “all done!” Sweetie pie. After intemission, he needed to step out a moment—just past bedtime, I think! Bill was going to take him out for air for one song and bring him back…but when they tried to come back, they found the door locked! They knocked, but the usher sitting down near it didn’t hear… Too bad. Eric really enjoyed one of the Sousa marches, and there were two more after the intermission. I was sad he missed out… but we have some more live theater field trips coming up, so he’ll have more opportunities! We also did quite a bit of math and language arts this week, too, of course, but I mostly don’t take pictures of those! It’s been a productive week! What a fun week! Tomorrow we wrap it all up with Music Together class with our buddies and then head off for an afternoon at Safari Park!